When I found out I was going to be a father for the first time, I wanted the house to be the cleanest it could be for the new baby. I wanted a healthy home. I cleaned everything I possibly could, but realized we needed our air ducts cleaned in the home, so I started looking for companies to clean the ducts for me. I came across a flyer that said “air duct cleaning for $79.99.” So I decided to call figuring that was a good price to clean our air ducts. I was disappointed to learn that special price was just a bait and switch tactic. Two guys arrived at my house 20 minutes after the time they were supposed to arrive. One of the guys began to clean only my vent covers, while the other walked me around my house and began to tell me my ducts were dirty. “Yes,” I explained, “That is the reason I called you.” I was told that the advertised price of $79.99 didn’t include actually cleaning the ducts! It would cost more to have the ducts cleaned. Of course, I was disappointed. I felt deceived, thanked them for vacuuming my vent covers, and invited them to leave. The second company I called to clean the air ducts in my home used an air compressor and blew air into the vents to force the dust and debris out. This is not an uncommon approach to cleaning air ducts. Being the diligent father I was, after the technician left I took a couple vent covers off and looked into the ducts myself. I found dust still clinging to the sides of the duct work. I ended up finishing the job myself. Getting a job done right! This miserable experience started thinking. Like most home owners, until now I had no idea what it took to get really clean air ducts in my home. I had hired two companies to get a job done, but in the end the job was not completed to my satisfaction. I decided to go ahead and get proper training in air duct and dryer vent cleaning. I wanted to offer homeowners in southeast Wisconsin— especially new parents—good quality duct cleaning from a company they could trust. Within six months I had researched and tested the best equipment on the market. 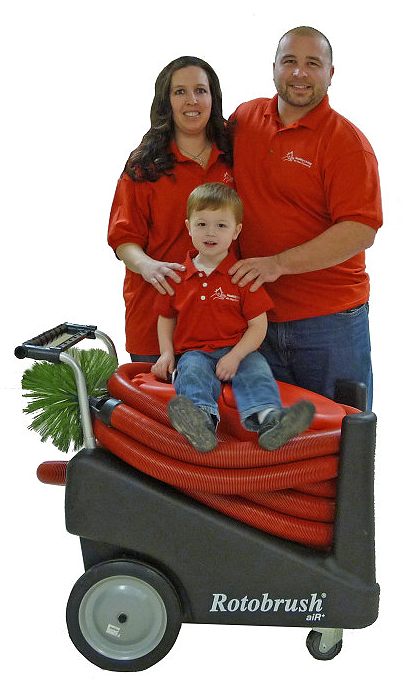 I started my company, Healthy Living Air Duct Cleaning offering the best possible service with the best equipment. Each and every one of my employees know the value of clean air ducts and dryer vents and their importance in keeping a healthy home. We offer the superior value, quality service, and unparalleled integrity I look for in any company I do business with. If you need the air ducts or dryer vents cleaned in your home and are looking for a job done right, call me today (262) 236.6750. My fiance and I are first time home owners. Before purchasing the house it was checked out by a team because there was mold found near the vent that the bathroom fan was connected to. The problem was resolved and eventually it was time to get our vents cleaned out. The original company that did it ripped us off and barely cleaned the vents. After researching for a few days I decided to call Healthy Living Air Duct Cleaning. Jonathan was so laid back and knowledgeable (because the ventilation system in our tri-level home is complicated). He came to scope out the house and spoke to us about every step he was going to go through to help us breath clean air. We were scared to go through anyone, but Jonathan is super professional and explains everything, making us feel comfortable. It was a long job and him and his Pops were able to get it done in a day! It was so noticeable the very first night and look forward to hiring him the next time we need a cleaning. Also, he went over and above by giving us some tips about other things we need to take care of in the house. This is a rare in this day and age for someone to take time out of their busy schedule to inquire about a few things we need to fix up in the house that does not involve the vents. You both did a superb job!! Our dog Dexter is even doing better since the cleaning. We moved into a house that had evidence of multiple pets all over the house (the carpet was ruined). Our home inspector recommended that we treat the floors once the carpet and pads were taken up and that cleared all the smell from the floors. He also recommended that we get our air ducts cleaned since there clearly were pets in the house and some family members are allergic to cats and dogs. That stopped the allergic reactions when people came in the house. They did a good, thorough job. Copyright © 2019 Healthy Living Air Duct Cleaning.All rights reserved.